Jamie McDonnell is determined to prove himself to be the best bantamweight on the planet before bidding the division goodbye. The Hatfield fighter will make the fifth defence of his WBA title on Saturday night when he faces Liborio Solis in Monte Carlo. While a move to super bantamweight has been long mooted, he continues to target a world title unification bout before making the step up in weight class. The WBA have ordered a bout between McDonnell and their ‘super’ champion at bantamweight, Rau’shee Warren, but the American declined the fight for 2016. WBC champion Shinsuke Yamanaka is widely recognised as the top fighter in the division and the prospect of facing the unbeaten Japanese ace excites McDonnell. “It’s a fight I’d definitely want,” he told the Free Press. “I know I’m the best in the world at the weight and I really want to prove that. “Yamanaka would be a really tough fight, probably the toughest out there for me at the weight, but I’m confident I could beat him. “I like the look of the Warren fight as well so we’ll see if that comes off. “There’s not been much talk from the promoters about Yamanaka but we weren’t a million miles off with Warren before he walked away. “We were offered Yamanaka a year or so ago but it was really short notice and crap money. It’s not a fight you want to be going into on short notice. “Hopefully that’ll come up because I’d be massively up for it. Opponent Solis is a former world champion at super flyweight and took Yamanaka the distance in a WBC bantamweight title fight in March, twice flooring the champion. While recognising Solis as a threat to his champion status, McDonnell believes this is a bout in which he can impress this weekend. He said: “I think it’s all set up for me to look good in this fight. “As long as I stay out of the way of his right hand, I’m pretty sure I can dominate this one. “I’ll just stay sharp, not do anything daft and let the shots flow. “If I can put the shots together, hopefully I can stop him late on and make a statement. “I’m not taking him lightly because I can’t afford to do that. 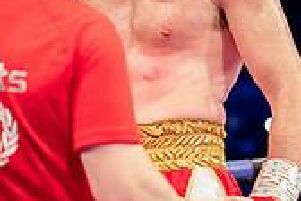 The last time McDonnell fought on the Mediterranean was six and a half years ago when he stopped Jerome Arnould to win the European title, just along the coast from Monte Carlo in Cannes. But he is expecting a much less hostile environment in the Salle des Etoiles Casino this weekend. The fight is part of a five bout bill from Matchroom Boxing with British fighters Martin Murray and Stephen Smith also involved. McDonnell said: “This will be like a home show so I think it’ll all be really comfortable. “I’m really looking forward to it. I’m just desperate to get out there and start the build-up.